Lenovo refines the already excellent ThinkPad X1 Carbon, making it smaller and lighter, while cutting bloatware and adding more power with Kaby Lake processors. The Lenovo ThinkPad X1 Carbon has always been the pinnacle of what a business laptop should be. Over the years we’ve seen small improvements to the series, but with the 2017 model, unveiled at CES 2017, Lenovo really has delivered, with a thinner and smaller design and almost no trade-offs. Measuring 12.7 x 8.5 x 0.6 inches (32.4 x 21.7 x 1.6cm; W x H x D), the latest X1 Carbon is noticeably smaller than the 2015 model, which measured 13.11 x 9.01 x 0.65 inches (33.3 x 22.9 x 1.65cm). At the same time the business Ultrabook’s weight has been cut from 2.65 pounds (1.21kg) to 2.49 pounds (1.12kg). Although the updated ThinkPad X1 Carbon is smaller and lighter in every way, it still features an 14-inch screen, and full-sized ports you'd expect on a business machine. To get here Lenovo has heavily reduced the size of all the screen bezels – although not to the same extent as it did when moving the webcam on the Lenovo Yoga 910. The webcam not only remains top and center, as it should on a business device, it's also been upgraded, with infrared face-detection to work in conjunction with Windows Hello. And that's not the only thing that’s been tweaked to Microsoft’s tune. The touchpad has also been improved, with Microsoft Precision Touchpad software and drivers. Windows 10 Signature Edition, the plainest version of Microsoft’s OS, also comes loaded on every X1 Carbon, so you won’t need to worry about pre-installed bloatware. Starting at $1,349 (about £1,100, AU$1,850), the Lenovo ThinkPad X1 Carbon is an expensive proposition compared to other options that start under a grand, like the Dell XPS 13 and Razer Blade Stealth. However, if you're okay with biting the bullet, hardware options include 7th-generation Intel Core processors, 128GB to 1TB SSDs, 16GB of memory and a 14-inch screen with an either Full HD or 2,560 x 1,440 WQHD resolution. 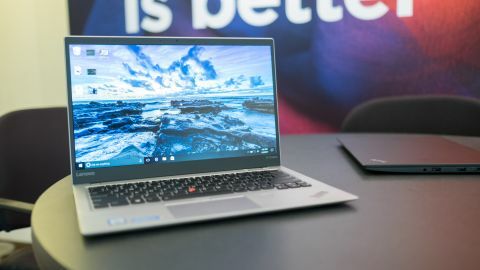 The X1 Carbon has always felt a little bigger than most other business notebooks, thanks to its toughened body and 14-inch larger screen, but that’s no longer a problem with this latest version. Smaller and lighter than ever before, the Lenovo ThinkPad X1 Carbon shows the laptop world how you can have a compact design that doesn’t sacrifice full-sized ports for a USB-C future. Beyond the physical changes, Lenovo has returned the X1 Carbon to a cleaner more refined state with Microsoft’s Precision Touchpad and Windows 10 Signature Edition. Even if you’re not looking for a business machine, you should look to the Lenovo ThinkPad X1 Carbon as an Ultrabook that gets things right.